When the Raptors acquired Demarre Carroll for four years 60 mill, in the sumemr of 2014. Many Raptor fans including me thought we found a wing defender that can spread the floor, a position that the Raps have struggled to fill for a very very long time. Now Carroll was coming off an injury, and there was a little hesitation in giving a recently injured player 60 million dollars for four years, but the Raptors thought they saw something special in Carroll that could translate from the 60 win Hawks, to the Raptors who were trying to build a foundation. But it was never really what it wanted to be, and injuries along with inconsistent play from both ends landed Demarre in Brooklyn after the nets acquired him, and a couple of 2018 first and second round picks for Justin Hamilton. The Demarre Carroll era ended quite sourly after never really fitting in like everyone hoped he would, and after voicing his concerns around “trust” in the Raptors locker room it was pretty clear that both Demarre and the Raptors organization would be moving on and the Raptors would have to once again look for a reliable wing defender. With Masai Ujiri doing what he does best in getting the best available asset for a mid-level player, the Raptors sent Greivis Vasquez to the Milwaukee Bucks for the 46th pick in the 2015 draft-which ended up being Norman Powell- along with the 20th pick in last years draft. The Raptors then selected a 6-8 Small Forward with length named OG Anunoby. 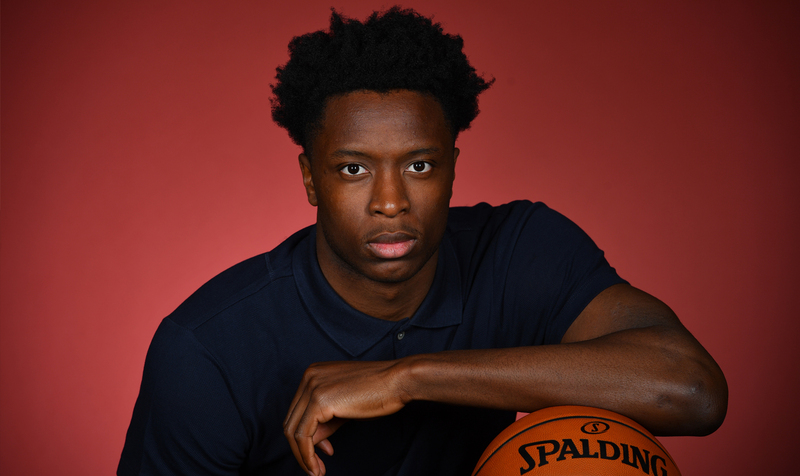 Coming out of Indiana University with the 20th pick in the 2017 NBA Draft, OG Anunoby came to the Raptors with a lot of size, and a real focus on his athleticism. It was like the NBA gods knew exactly what kind of player the Raptors needed, and they were gifted in the 23 spot in the draft to have OG land right on their laps. His shooting may not exactly be what Demarre had for the Raptors, but his ability to do the little things that Carroll couldn’t makes this a promising future for the Raptors, without them having to give up anything big. The Raptors have implemented a more team oriented playbook offensively, which correlates with more attempts from the three point line. It is more of a turn to the modern and now progressive NBA style, then what The Raptors and their fans have been used too. While the scoring for OG has still some room to grow, his ability to fit into the new system so well early on shows his commitment, and to go with it his ability to jump-start the offense with his impressive defense helps the Raps go on the break and find shooters. He is one of the bench guys that is showing growth and promise, and with the Raptors starting to build a fun and youthful future, with guys like Delon and Jakob Pertl having some of the best games of their career,and with the amount of depth the Raptors have with OG and crew give the ability to rest Demar and Lowry more, which has always been an issue in the past. There have only been around 6-7 games played in a long season, and guys will go up and go way down during the season as expected. Regression is inevitable for guys just coming into the league, people call it the rookie wall where guys hit a big wall and struggle after 20 or so games. But as long as OG remains strong on defense, and is willing to be a key factor in the bench unit being able to share the ball, this could be a positive rookie year and give Raptor fans a chance to see what he is really made of in years future. What really makes OG a coveted rookie for the Raptors is his defense, particularity in his ability to get tough steals. His time at Indiana he was tasked in guarding some of the nations best players, like Frank Mason III of Kansas. His ability to be quick on his feet and using his length to disrupt players rhythm is very impressive with his size. His defensive game is transiting well into the NBA and he has shown great toughness is hustle situations. The Raptors didn’t have to wait long to find another good wing defender after Carroll left, and with Masai being so trustworthy in his young guns to lead the future of the Raptors, dreaming of an OG Anunoby defensive player of the year speech is something that could be more and more of a reality by the day. The Toronto Raptors have begun to grow a foundation past the likes of Kyle Lowry and Demar Derozan, because they won’t be here forever and Masai knows that. He needs to be able to build a stable core that can be transitioned well after their best players have moved on. I still think Norman Powell will become something, even after a real struggle to the season. Delon Wright has grooved real well in the backup guard spot, and guys like Jacob Pertl and Pascal Siakim have played maybe their best basketball of their short NBA careers so far. OG Anunoby has molded nicely into another promising young player for the Raptors, and they continue to find diamonds in the rough in the drafts after trading away mid level talent to teams in their conference. Who knows what will happen to this team come a couple months from now, but if OG Anunoby plays like he has been playing to start the season, the Raptors have their next star defender and another young and promising stud.